As sweet as cinnamon: Our first Quilt ! ...all the time they ask to do some. We set about to make them their first quilt back in January. A few mini charm packs from the Moda Sampler box. we sewed and sewed and added some borders. All finished and keeping our babies warm. That is really sweet Dawn, you have given them a great start to possibly a life time love of sewing. When my son was 9 he wanted to make a quilt, he made an eye spy quilt consisting of 8" squares of fabric which he joined and put a border on.The 'paid' me to quilt it for him.He paid with 3 hugs,2 milo's & 2 Jam & peanutbutter sandwiches.I am proud of him and I'm sure he is of himself. Your sweet girls will have a lifetime of enjoyment out of their sewing now!!!! Hugs from Sandy. What lovely quilt you have made for your dollies with Mummy's help. Have fun making a bigger quilt for your little nephew.What fabrics will you choose??? That is soooo sweet!! And the quilts are fabulous!!! Good job!!!! I enjoy sewing with my daughters as well. Helping and instructing as they gain more independence in their sewing/quilting skills. I tried getting my daughter to sew but .... Hopefully one day I can get my granddaughter to. But first , I need to get my children to get married ! Lol. Congratulations to your little ones! What a great job they have done. Sweet pictures too. I just love the picture of the one at the sewing machine! Both of you girls have done a beautiful job on your dolly's quilt. I know they are happy to have it. Tell your mommy how lucky she is to have such talented daughhters. Excellent job ladies!!! Dawn, your girls are too darling, they look so proud and well they should. They did a fabulous job, and so did you, teaching them! 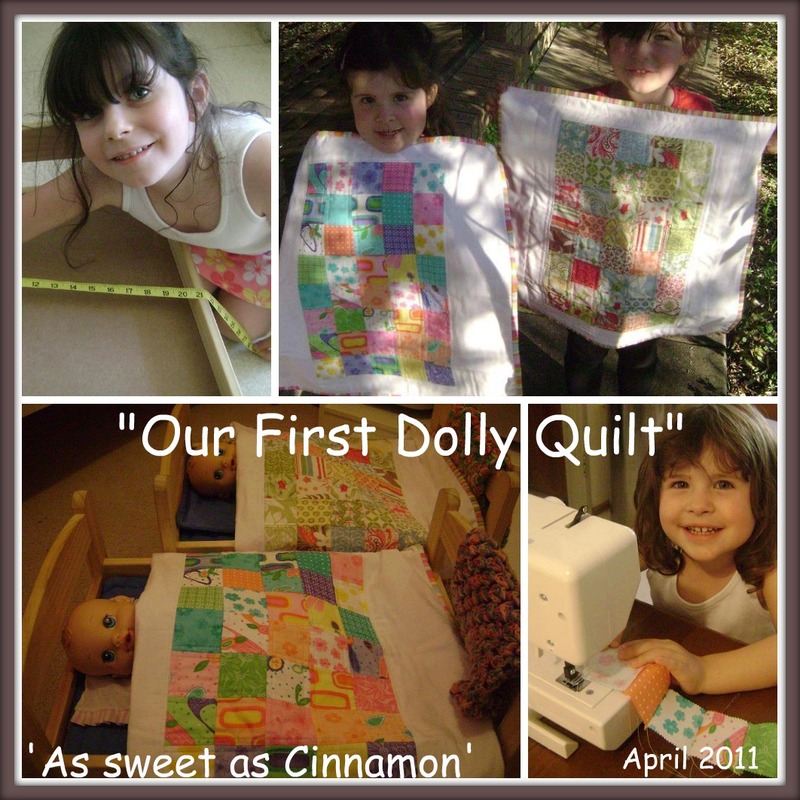 Your cute girls should be so proud of themselves - what lovely little dolly quilts! Oh my, they are so cute and so lucky to have a wonderful talented Mum! Those quilts are so cute....good work...tell them they are awesome! Oh that is just so cute.